For Asian international students, the level of career certainty is positively correlated with the intent to persist through the academic program. International students are more likely to be influenced by families in their career decisions than their domestic counterparts. School counselors play a more significant role in shaping choices of an academic major and career for Asian international than non-Asian international students. A research titled “Factors Influencing International Students’ Career Choice: A Comparative Study”, published by Professors Singaravelu, White and Bringaze of the University of Missouri-Columbia, examines the career development behavior of Asian and non-Asian international students as well as domestic students. The research shows no significant differences in degrees of career certainty among Asian international, non-Asian international, or the domestic students. 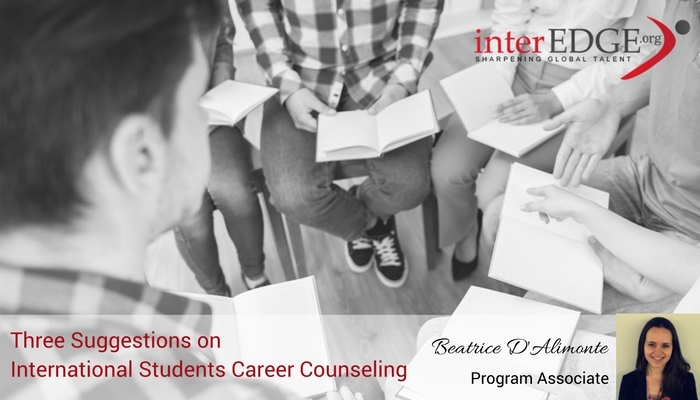 Domestic students showed the least of family influence in their career decisions, while non-Asian international students showed the least influence of school counselors. The only group demonstrating a particular relationship between their level of career certainty and intent to persist the academic program is the segment of Asian international students. Conduct group counseling sessions: it will create a sense of community, safety, and security and reduces their hesitation in sharing personal stories and information. Use narrative techniques: It will allow counselors to take a learner’s role in gaining a better understanding of different cultural contexts and the student’s life journey. It will also serve as a process to explore occupations and career decisions with one’s cultural and family values taken into consideration. Develop genograms: Incorporating this technique in individual sessions helps counselors gain insights into student’s family values, beliefs, gender roles and acceptable career paths. Through the process, students will gain self-awareness of the impact of his or her upbringing on career choices as well. Do you currently employ any of the three techniques? Share with us your experience by commenting below.